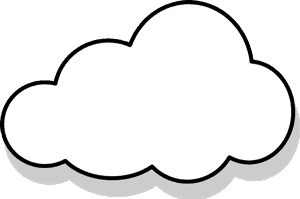 Before we talk about Cloud Applications do you know what the Cloud is? This isn’t a white puffy thing in the sky. Nope. We are talking about the Internet here. The cloud is the Internet. Years ago the Tech guys (me included) would draw a cloud to represent the Internet to easily explain that there are millions of websites and computers on the Internet. The cloud is a symbol of millions of computers all over the globe. In other words the Cloud is like saying I’m from New York, its a vague description of where I’m from. If your data is in the cloud, its a vague description of where that information is located. When I have an application on the internet, it is not on one computer, its on many computers and is accessible from any where in the world. Google’s website is powered by tens of thousands of computers, which makes it fast and reliable. If one computer goes down, the website or web application still functions since there are a lot of computers. One of the great things about Cloud applications is that they are redundant and are more likely to be available 24/7. You would go to a website, create a login and use this program instead of going to the store, buying software and installing it on your computer. Accessing a website means that you don’t download a program either. Also you will not need to update the software or use just one computer, if you have a Cloud Application. This means if your laptop is broken, all your data can be accessed by another computer or smart phone, your business doesn’t lose money because of a broken device. If you have an email with Gmail, Yahoo, MSN or another online company then you are already using a Cloud Application. Also if you do online banking with your bank and have logged in to see your account and pay your bills, you are using a Cloud Application. Google Docs is a great example of a Cloud Application that can replace a current application. You can write a document in google docs like you can in MS Word. However, unlike MS Word you are doing this in your web browser and the files are not located on your computer at all. The files are on the Cloud. You can download them in MS Word or PDF format if you need a copy but having them on the Cloud has its advantages. Cloud applications are redundant, the companies have hundreds or thousands of computers running them. We IT guys refer to these computers as servers. Cloud Applications don’t care what operating system or computer you are using. This means you can access the applications from anywhere there is a computer, not just the computer you installed the software on. Most Cloud Applications are Mobile. You can use your mobile phone or tablet to use the application. The overall cost of a cloud application over the years will be cheaper then a standard installed application, hardware installation and support. You spend a lot of money for IT support. If you use a Cloud Application, you are paying for the application monthly or yearly and includes IT Support. You are now leasing the software with all the updates and Support from the company. For example, if your company has 10 employees and you need to choose between Google Apps or having a server in your office and install Microsoft Small business server, then the cost for purchasing Google Apps would be $50 a person per year with technical support. That would come out to $500 a year. While a server costs at least $2,000 and the Operating System is around $1,000. On top of the $3,000 or more you will need to pay someone to install and maintain, meaning your overall cost of owner ship for a ten person company could go as high as $10,000 a year just for file sharing and email. With Google Apps, you can have technical support and keep within a budget of $500 without adding any servers or extra equipment that will cost your company. Since the applications are online and no software is needed to be installed, you use your IT consultant less. If something happens to your computer, your files are stored online and not locally on your computer which means you just need to use another computer, a smart pone or buy a new one. Plus most of these softwares can be used with a mobile device that would mean limited or no down time for your business. Should all my applications be on the cloud? No. That is not necessary. You can also use the cloud to store data which your regular applications use. This means you can have your data backed up and accessible at all times. You would just need to re-install your application. I use applications that can not be cloud applications like Curio and Photoshop. However, I do backup my data that I use these applications for with a Cloud Application. What are Cloud Applications that you recommend? Cloud Applications are easier and cheaper to maintain. In the long run they require less investment and IT consultants to come into your office. The issues will be security and maintenance, knowing which applications your company has purchased and who has access to these accounts. I suggest creating an operations manual to keep track of all your online applications. If you are not enjoying the benefits of Cloud Applications, I suggest you research them. participate in today’s technology-enabled flow of business opportunity. (data) exchange that single-framework enterprise systems provide. Joanie I agree. As technology advances a more centralized approach will be better for small businesses The one thing I tell my clients is Cloud applications are equivalent to leasing software and support. Since this means you can lease your software from different companies that are experts in different areas. You are not subjected to what one vendor can offer, however you may have the same login and link through portals like Google Apps.